John Fabbricatore is an honorably discharged veteran of the United States Air Force, having served as a Security Forces member from 1991 to 1995. Since 1995, John has served as an active law enforcement officer. John was an Instructor at the Federal Law Enforcement Training Center from 2003 to 2005, where he focused on teaching Defensive Tactics, Physical Fitness and Fugitive Operations. 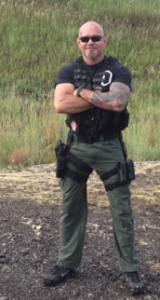 John is currently a law enforcement supervisor involved in Fugitive Operations. As an active martial artists for over twenty years, John has successfully competed in Mixed Martial Arts (MMA), boxing, submission grappling and kickboxing. John is a survivor of violence. At the age of fifteen, he was the victim of a violent kidnapping, during which he was stabbed multiple times and subjected to torture for nearly two hours. After surviving this attack, John devoted himself to becoming a competent and knowledgeable martial artist and student in self-defense. Since attaining that goal, John has dedicated himself to sharing his knowledge, determination, and motivational story with others. John is a tireless advocate for survivors and believes that everyone has an undeniable right to defend themselves. Competitive training since 2000 in Brazilian Jiu Jitsu and submission wrestling. My hubby truly enjoyed the class!! !